All eyes are on Apple ahead of Monday, when the company is expected to debut a new streaming TV service and a bundled subscription Apple News offering. Street analysts and investors alike believe this could be the catalyst that propels the stock back to previous highs. The stock was up slightly in Friday's premarket trading, after gaining as much as 4 percent during Thursday's session. 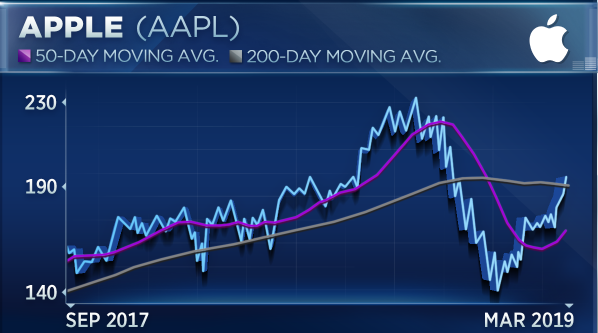 It's now back above its 200-day moving average for the first time since November, pushed higher by a series of bullish calls on Thursday. Needham upgraded the stock to a strong buy, while Wedbush and Citi hiked their targets to $215 and $220, respectively. Shares of the tech giant have bounced nearly 40 percent since sliding to a 52-week low at the beginning of the year, but are still in correction territory with the stock roughly 16 percent off its October all-time high. Following this spike higher, the Street is split on whether now is the time to buy Apple. From a fundamental standpoint, Mark Tepper, president and CEO of Strategic Wealth Partners, said the stock is a buy since the "ecosystem is incredibly strong," while Bill Baruch, president of Blue Line Futures, said not to chase it at current levels. Tepper contends that the Street is finally beginning to learn how to properly value Apple. For a long time it was seen as predominantly a hardware company, so when the company began shifting more toward a services business the Street didn't necessarily know how to properly value the different revenue streams. "I think it just took the market and analysts a little bit of time to digest this strategy shift where they're going from selling iPhones, which was decelerating, and they've been shifting toward more of a focus on the wearables and services. And when you talk about services that's all recurring revenue and high margin," Tepper said Thursday on CNBC's "Trading Nation." Apple bears have frequently cited "peak iPhone" as a reason to sell the stock, but Tepper contends that the company's "ecosystem is incredibly strong" since through the focus on services, Apple is locking in customers for the long term. "They can offer services, recurring revenue, high margin services to these sticky customers, and now they're likely going to be jumping into the content wars, with maybe Apple TV or whatever they're going to brand it with this streaming service. And as we know good, original content costs money and it's getting more expensive, and nobody has more money to win at that game than Apple." Ultimately he argues that the tech giant may not be the "growth company that it was 10 years ago," but that it still "absolutely" belongs in investors' portfolios. Blue Line Futures' Baruch is long-term bullish on Apple, but he thinks investors shouldn't "chase it into that battleground of $195 - $200," and should instead wait for a better entry point. After examining the company's stock charts — paying particular attention to the average directional movement index — he notes the shares are trading in a range that has, in the past, given them some trouble. 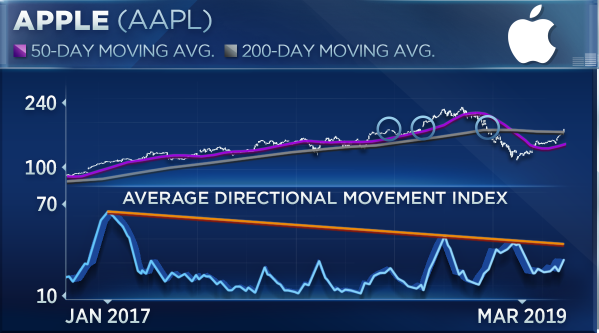 "[I] want to take a look at that ADX [average directional movement index], and if you back that out going back to 2017 there's actually a trend line in the ADX where that trend starts to lose momentum, and it [shares of Apple] is running into that," he said. The ADX is a technical indicator used to evaluate the strength or weakness of a trend without regard to trend direction. In this case, Baruch said that "there's a little more room here for Apple to go," but that when the stock has traded in the $195 - $200 range in the last few years it has sometimes struggled to maintain those levels. Apple closed at just over $195 on Thursday. Baruch advised waiting "for a little more clarity" or a "little pullback" before picking up shares, but that overall there's "no reason not to be" bullish. — CNBC's Todd Haselton contributed reporting.